After celebrating the holidays with our families in Boston, California, and then Boston again, with only brief stopovers at our apartment in New York City in between, it was bittersweet to wake up at home in my own bed and send my husband back off to work as usual this morning. But I'm filled with a sense of purpose with the beginning of the new year and I feel like it's time to clean up and out. Today I am taking down the tree and the rest of the decorations, doing all our travel laundry, and getting ready for a clean, bright, fresh new start of the year. 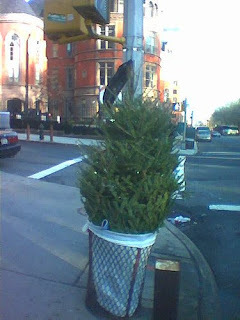 If you are doing the same, make sure you check with your local garbage pick-up and dispose of things properly (unlike this poor tree!) Most trees can be recycled into mulch- if you live in New York, the department of sanitation will pick them up with your regular garbage through Friday, Jan. 16, or you can drop them off at a MulchFest location this weekend. Plus, I'm off to the post office to send off the Christmas cards and presents I didn't get out before the holiday tidal wave hit me. I'm guessing the post office will be a little more manageable now! I'm also attacking some of my New Year's resolutions head-on. I joined the New York Road Runners, as a first step to building up to running a marathon this Fall. I will be running in a half-marathon in Central Park at the end of this month, and taking advantage of their races and other training aids and classes throughout the year. Naturally, I have already wiled away several hours on Petfinder.com, looking to adopt a dog. There are so many wonderful animals in shelters, I don't know how we're going to be able to choose just one...if you are considering buying a cat or dog from a pet store, I hope you'll take a moment to check out all the cuties on Petfinder, and consider adopting instead. I think they will give you paws, (but that's just my opunion). And, I'm back blogging (and making bad jokes) now, and will do so consistently every Monday-Friday, once again. My apologies for my absence over the holidays- I'm hoping you were all too busy with family and friends to notice. Lots of love and thanks to our own families and friends who kept us so happily spoiled rotten and busily entertained these last couple of weeks (SB and Boston, we love you)! you're getting a dog?! I'm so excited for you! and it reminded me that I read in a magazine over the holidays that on January 24, 2009 you can adopt a dog for free (not pay the usual $500+ adoption fees) at some participating shelters as part of Change a Pet's Life Day. North Shore Animal League is also a great shelter. They do pet adoption drives at Petco on the weekends. They actually make you have character references! !